More than 1,000 people took to the streets of Bucharest on Sunday (November 10), asking for the reinstatement of the monarchy in Romania. People chanted asking for King Michael I of Romania to take his seat at the Cotroceni Palace – which is now the presidency headquarters. The groups also chanted slogans such as ‘Monarchy saves Romania’. 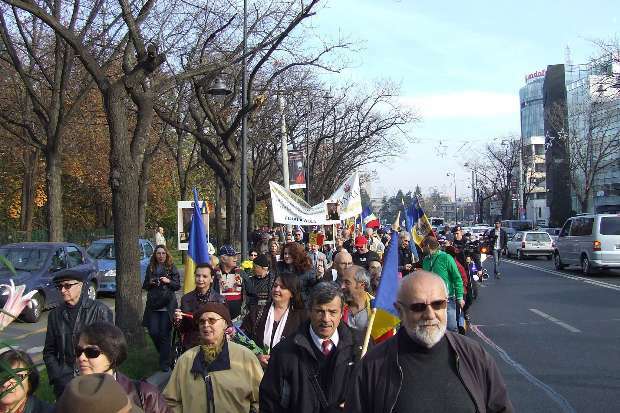 The organizers of the march, the National Alliance for Reinstating Monarchy, gathered young and old people from Bucharest as well as from Alba Iulia, Cluj, Constanta, Galati and Ploiesti, who all met in the Charles de Gaulle plaza in the Romanian capital. The march continued on Kiselef boulevard to Victoriei Square, then to the King’s Square, where protesters brought flowers to the King Michael’s statue. They then continued on Calea Victoriei to the revolutiei Square, and stopped at the equestrian statue of King Carol I.
Romania is currently a parliamentary republic, with a two-Chamber Parliament. The president is elected by the people, who also vote on the members of the Parliament. The Prime Minister is then named by the President, and the PM chooses the Government ministers. Romania was a monarchy until 1947, when king Michael I was forced to abdicate. From 1866 to 1947, Romania had had four foreign kings, Carol I, Ferdinand, Carol II and Michael I. A foreign king was brought in 1866 at the initiative of Romanian politicians, after Romanian Alexandru Ioan Cuza was forced to abdicate. Carol of Hohenzollern-Sigmaringen was the politicians’ second choice, but he accepted, starting the Hohenzollern-Sigmaringen dynasty in Romania. King Michael I of Romania, currently 92, chose to break the bond with the House of Hohenzollern and give up on the title Hohenzollern-Sigmaringen, which gives the Royal House of Romania a national and independent status. This decision was made taking into account Kind Ferdinand I’s decision in 1921. King Ferdinand I was King Michael’s grandfather. Based on Ferdinand’s decision, all members of the Romanian royal family have the surname “Of Romania”. Following the recent decision, the Royal House will no longer be called The House of Hohenzollern-Sigmaringen, but the Royal House of Romania. The members of the Royal Family will also give up all their titles given by the heads of the Hohenzollern royal family. The House of Hohenzollern is one of the most important dynasties in Europe. The Hohenzollern-Sigmaringen is a wing of the Hohenzollern dynasty. Kings Carol I (1881-1914), Ferdinand I of Romania (1912-1921), Mihai I (Michael) of Romania (1927-1930 and 1940-1947) and Carol II of Romania (1930-1940) are part of this dynasty.